This is an easy chocolate tart that doesn't require any baking! Just mix it all together and let it set to make a scrumptious dessert that will be the envy of all your dinner guests. The tart ends up having a similar texture to a chocolate mousse cake, with a crunchy biscuit base that holds everything together without needing to make pastry as well (even though some nice chocolate pastry would make this tart even more delicious!). Make the biscuit base first - Crush the sweet biscuits into fine crumbs. Melt the butter, then mix the melted butter with the biscuit crumbs. Press the biscuit and butter mixture firmly into the base of a round springform cake baking tin. Place the baking tin into the refrigerator to chill while making the chocolate tart filling. Whip the cream until it is light and fluffy. Set this aside. Melt the dark chocolate and the milk chocolate until smooth and creamy. Add the icing sugar to the melted chocolate and stir to combine it all together. Set this aside for about 5 minutes to let it cool slightly before adding it to the whipped cream. Pour the chocolate mixture onto the whipped cream and fold everything together until the ingredients are completely combined. 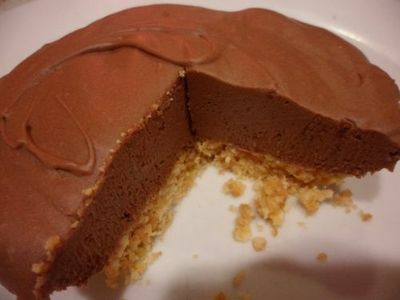 Spoon the chocolate tart filling over the chilled biscuit base, spreading it out evenly with a spoon or knife. Leave the tart in the refrigerator for at least two hours to set before serving. Ideally, make the tart the night or morning before you want to serve it and let it set for longer. To serve - slice the tart up (it will make about 10-12 pieces) and add a dollop of cream or icecream and even some berries.